Enquire or book a trip along Châu Đốc - Cần Thơ - Long Xuyên. Boarding at the Chau Doc pier, welcome drink, introduction to the ship and crew, check into your cabin. Departure downstream on the Bassac river, as the crew serves lunch. Upon arrival at Thot Not, transfer on the longboat for a visit of a village. Boarding back before dusk, a welcome drink and the dinner are served on board while en route. Rest on the deck before the night. The Bassac drops anchor near Long Xuyen for the night. Breakfast is served from 6:30 AM, as the Bassac is on its way downstream the river towards Can Tho. Arrival in Cai Rang floating market, transfer onto a local boat to visit the floating market, then a noodle factory and return to the Ninh Kieu pier. Arrival at Ninh Kieu, Can Tho, by mid-morning. Boarding at Can Tho at Ninh Kieu pier. Welcome drink, departure upstream of the Hau river. Lunch on board while en route. Upon arrival at Thot Not, transfer on the longboat to take some walks at a village in Thot Not. Boarding back at dusk, welcome drink the dinner is served on board. Rest on the deck before the night. 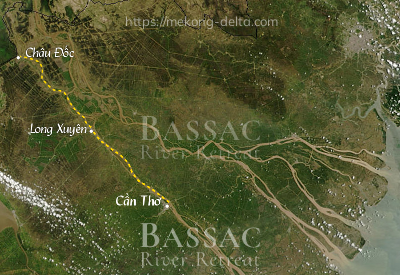 The Bassac drops anchors near Long Xuyen for the night. Breakfast is available from 6:30 AM, quiet on the river. Visit on shore of a crocodile farm. Check-out and visit of a market in Long Xuyen. End of services by mid-morning on shore at Long Xuyên. Here are some extension possibilities about the journey you are preparing. These, for the most part, we manage ourselves. May you find here some inspiration. Before boarding, you may come all the way from Cambodia's Phnom Penh if you charter a speedboat, a trip that takes you through the frontier in no more than 5 hours. Otherwise, depending on the time schedule of the speedboats, you may have to spend a night in Châu Đốc. Think of preparing a visa to Vietnam beforehand. You may simply ask us to book any of these extensions, just mention it when booking the Bassac. We can also help you with the road transfer arrangements.